As civic engagement is an essential part of a democratic society, many college educators believe that it should be encouraged or required of students. The survey reported here gathered information on past and present civic activities from 2,327 students at a large, very diverse urban community college. Results showed strong agreement with the proposition that the college had a responsibility to develop civically engaged students. Principal components analysis of responses revealed four distinct factors: general non-political civic engagement, and low-effort, high-effort, and unconventional political activities. 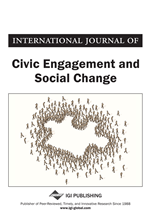 Many students did not regard themselves as civically engaged yet reported extensive activity. More civically engaged students tended to be male, older, and not employed full-time. Ethnicity was related to engagement in complex ways. Students with a service-oriented program of study were expected to report more civic engagement, but evidence for this was minimal. Political party identification was a poor predictor of student responses. In a democratic society, civic engagement can produce positive outcomes in a number of forums that mobilize individual and collaborative participation in meeting the needs of a community or the needs of a global organization. In higher education, civic engagement involves the political and social activism of campus members working together to address an issue, change a political policy or reconstitute authentic democracy on a campus (Ehrlich, 2000). According to Ladd (1999), “an individualist democracy is unusually dependent on harnessing collective or cooperative energies” (p. 1). In America, democracy is built on the activism of its citizens. As Ehrlich (2000) pointed out, “A morally and civically responsible individual recognizes himself or herself as a member of a larger social fabric and therefore considers social problems to be at least partly his or her own” (p. xxvi). Similarly, civic engagement in higher education is built on the political activism of its school community members. Active civic collaboration is achieved by a diversity of groups and service organizations engaged in a social contract of thought and purpose. In 1999, Ladd noted, “the engagement of individual citizens in a vast array of groups and voluntary service and charities is generating social capital as never before. This capital is now being spent to meet community needs in every town and city in America” (1999, p. 3). Despite the recent polarization in Congress, long-term trends continue towards a resilient civil society. According to Boyte (2008), “America in the last generation has… been a laboratory for creative civic experiments. These have generated an everyday politics of negotiation and collaboration that is more concerned with solving problems than with apportioning blame along ideological lines” (p. 1). The tide of change was supported in President George W. Bush’s 2002 “State of the Union Address.” Stolberg (2008) noted that in 2002, “Mr. Bush offered a grand domestic vision: to create ‘a new culture of responsibility’ in America” (p. 1). President Bush challenged Americans to “devote at least two years — 4,000 hours — of their lives to public service. He promised to expand AmeriCorps, the so-called domestic Peace Corps, and double the size of the Peace Corps itself” (Stolberg, 2008, p. 1). However, Stolberg concluded that by 2008 the initiative was seen by knowledgeable observers as “sputtering.” Ironically, it can be argued that the resurgence of local activism envisioned by President Bush only fully developed six years later in the campaign of his replacement. Barack Obama’s campaign and his landmark success in building an enthusiastic grass-roots organization revitalized public interest in civic engagement. In recent years, at least two major and opposed trends have received a great deal of attention: the Tea Party and Occupy movements. In the U.S., civic engagement in general appears to be accepted almost unquestioningly as a public good. In higher education, there is at least token agreement with the principles of encouraging civic engagement. As stated by Eric Liu, a member of the National Task Force on Civic Learning and Democratic Engagement, “one of the most fundamental purposes of higher education… is to create citizens who are able to govern themselves.” Yet Liu went on to say that “in the last couple of decades, especially during the Great Recession, there’s a real emphasis on the economic purpose of education” (quoted in Banning, 2012, paras. 4 & 5). Test scores and surveys show that the level of civic knowledge has declined among high school graduates, and according to the American Association of Colleges and Universities (AAC&U, 2012), a recent survey shows that only one-third of college students felt that their college experience had substantially increased their civic awareness, skills, or commitment. The improvement of civic engagement as a goal of education dates back at least to the writings of John Dewey (1859-1952). Dewey saw “school as a social center… public schools are particularly well suited… to function as neighborhood ‘hubs’ or ‘centers’ around which local partnerships can be generated and developed” (Benson, Harkavy, & Puckett, 2007, p. 85). Within the community of public schools are located the stakeholders actively involved in decision-making and conversation around strategic plans and the day-to-day issues that consistently impact community members.